Some readers will recall that over the last two years we've covered in our print edition the restoration of a 122S, known only as "Carolyn's Amazon," to its stunning outcome. We'll be concluding that series in the web edition shortly. Now we're starting on a second Amazon restoration; this time it's Marsha's own 122S. As the car has come apart and the extent of its decrepitude has become increasingly apparent, I can't really call this one a "restoration" -- "resurrection" is more appropriate. It's also obvious that it would be far cheaper to buy another hulk of a 122 and restore it instead, but we've chosen to go on with this one. This particular car's history may help you understand why. I first met the car (and Marsha) in 1979 when we both worked for a Santa Barbara, CA, aerospace outfit. It was her first car, it had 150,000 well-maintained miles on it, and she was its fourth owner. I liked European cars in general, but had no particular interest in Volvos at the time. In 1980 I moved to the San Fernando Valley in the Los Angeles area to work in the music business, and forgot all about the car for some years. I didn't forget about Marsha, though, and in 1983 she moved down to be with me. Due to the vagaries of fate, finances and a divorce, the car had fallen on hard times. It had been rear-ended hard twice and repaired cheaply. It had been front-ended once and not repaired at all. 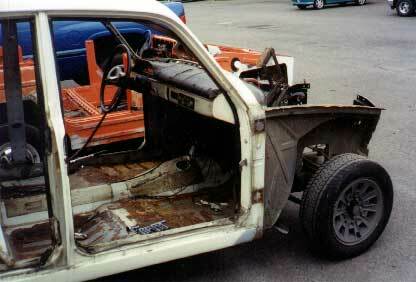 It ran raggedly, the interior was trashed and nothing electrical worked except for the headlights. Having repairs done at various import specialty garages turned out to be a way to spend lots of money without any discernable improvements to the car's running or reliability. A Haynes manual and tinkering with basic hand tools worked better. By the time we moved to an unincorporated stretch of beach in Ventura County in 1989, "the Volvo" (the only name we've ever had for the car) was my main transportation, and absolutely reliable in the sense that I could do roadside repairs on anything that broke -- which things often did -- so I always got where I was going. Just after we moved to the beach, the car reached the cosmetic high point of the time I've known it. After bolting on a good hood, some uncrunched fenders, and having the nose section pulled out, we gave it a cheap paint job and I became quite proud to be driving the old thing. We both had good-paying jobs (in aerospace and computers) and could have afforded a new car, but I'd become as attached to this one as Marsha had been from the start. Old Volvos will do that to you if you give them half a chance. Over the next decade, the Volvo taught me most of what I know about these beasties. It gradually got every IPD mod available (plus a few older NLA ones), halogen lights, a Delco alternator conversion from Swedish Embassy, wide wheels and tires, an overdrive, a variety of custom exhaust systems, and generally served as a test bed for experiments for the next 300,000 miles; some good, some stupid. Along the way, we somehow started a website, won several navigational rallies, bought an 1800S as a project, moved to the Northwest in 1998, got jobs doing web development and other design work, made some really good friends and ran a magazine for a while. None of this would have happened if not for the Volvo. 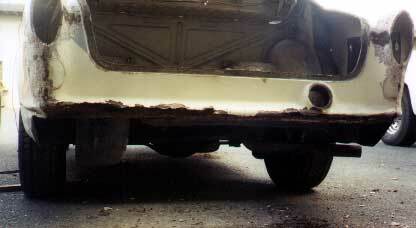 You don't just give up on a car like that, even when rust becomes a major problem. Hot summers in Los Angeles (temperatures well over 100 degrees F. are common in the valleys) had melted and crumbled the protective rubber matting on the floors, and, later, the beach had been a brutally corrosive environment. 30 MPH winds would blow salty sand over and into the car every afternoon. Drippy night and morning fog would then spread the salt into every nook and cranny. There was no keeping up with it -- even new cars would start showing rust after six months despite their owners' best efforts. I patched what I could with POR-15, fiberglass and Bondo, but I'm certainly no body man capable of shaping and welding in new metal. After a few years in the Northwest rain, my amateur repairs were disintegrating. The 1800S had become a reliable driver, so the time had come to take some serious action. Last November, the Volvo went to Shayne Green's house in Portland, OR, for disassembly and evaluation. Shayne uncovered more holes I hadn't known about, but nothing serious enough to make us consider abandoning the project. After months of slowly being stripped down to a rolling chassis, in June the Volvo departed on a flatbed truck for that Mecca of European car restoration: The Works in Eugene, OR. If it could be fixed, and fixed right, Bob Moreno would be the one to do it. As what remained of the paint came off, Bob found more problems, and daunting ones. The cheapness of the repairs done after both rear collisions had come home to roost -- the car was not only full of holes; it was fundamentally bent. 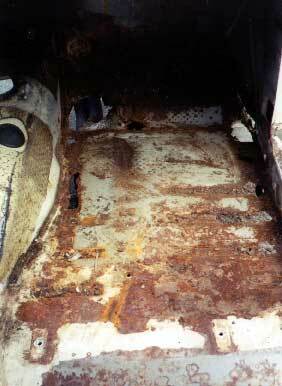 The metal of the trunk floor and under the rear seat wasn't flat. What I'd always thought of as shallow, minor dents in the roof and rear fender (the kind you only notice when a reflection hits just right) were actually places the metal had bowed from compaction. One rear door opening was measurably shorter than the other. It's one thing to weld in new floors and a few body panels, but restoring structural integrity to a bent car is another matter entirely. The whole rear of the car would somehow have to be stretched back out to its original dimensions to relieve stress on metal in other areas. Marsha had always said that while the first rear-ender was quite hard, the second one was a mere tap that nonetheless crumpled the car as badly as the first. I now understand why -- a bent car does not have the strength of a straight car. Could Bob actually return it to being as strong as the day it left the factory? Bob says he can. Naturally, our estimate went up another few notches... but hey, you don't give up on a car like this. We, at least, have decided to go ahead with it. The Volvo deserves it. Our friend Shayne Green reduced the car to a rolling chassis and uncovered as much damage as he sensibly could. Bob took it from there. Here's the car shortly after arriving at The Works. 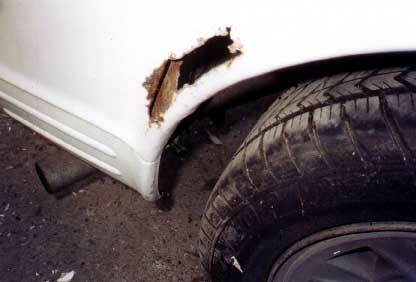 Look closely at this pic and you'll see lots of Bondo from previous cheap repairs. All that's coming off the car. You can also see where water snuck in under the Bondo, rusting out the whole lower part of the tail panel. The panel is being replaced with fresh sheet metal supplied by Tom Swartz. The body has rusted through anywhere that water could be trapped. There are similar holes in both C pillars which began under the trim strip that continues the rear window trim to the sides of the car. This probably calls for new metal, too. I'll let Bob be the judge. Ever since I've known the car, the battery box was lined with old inner tube rubber. I left it there thinking it might be good protection against battery acid. It wasn't. A new box supplied by Tom will be installed. 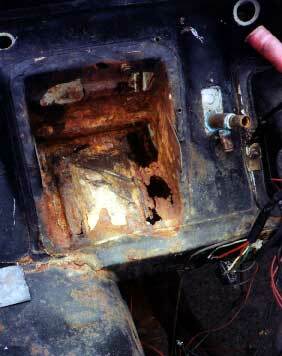 Also note that a closed hood is no protection against salty beach sand, as the general rust in the engine compartment shows. Here's what was under the melted floor matting. The hole through the firewall (that black lump to the forward right of the transmission tunnel is the header) is mostly due to battery acid dripping down from the holes in the battery box, and it actually ate into the top of one of the box sections under the floor. This floor will be replaced with a new stock section. The other floors are not as bad and it's less expensive to fix them with metal Bob will fabricate. With both flat and angled sections of this floor affected, the fabrication becomes more complicated and it's actually cheaper to buy a whole new section. Here's much of the rest of the body. The parts that aren't white are potentially good sections that I picked up from Shayne over the years, knowing that painting is a lot easier than patching the ones we had. 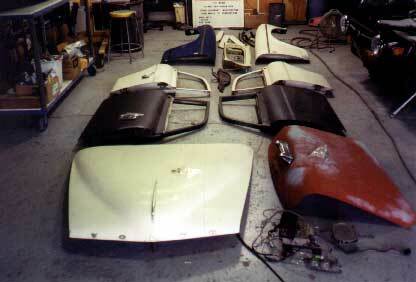 This will actually be the third generation of fenders and trunk lids on this particular car. For some reason, the front doors had significant rust, but the back ones stayed good. The Works is in Eugene, OR. Photos courtesy of Bob Moreno.